9 days until A turns 2. How crazy is that? I have been having lots of fun with this little munchkin lately…she’s been keeping me very busy & laughing all the time! Today…we are sending thanks out to our friends in NC the G Family for an AWESOME birthday present they sent over! They sent us a bounce house!!!!!! A is going to freak this morning when I set it up for her! This should help get her nice and tired for nap time!!! Happy Thursday everyone! 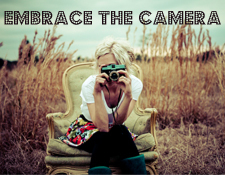 Go Embrace the Camera…your kids will thank you! Adorable picture–enjoy the bounce house! How fun! Great picture! What a cutie! My guy will be 3 on Tuesday. We got him a bounce house for his party. So fun! What a beautiful little girl! This is a great picture of you guys, enjoy her birthday! What a little sweetie! And have tons of fun with that bounce house! She will be thrilled!! !